A beautiful and eternal Tarsus. The triple dock is mainly for aesthetics - although it does help compensate for the long distance to the river entry/exit points. 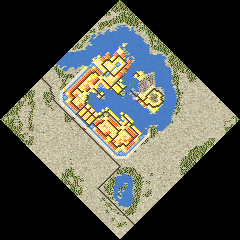 This city also looks quite pretty when oriented south - incoming ships will get an impressive view of the villas and grand temple to Neptune, before sailing into the heart of this trade-port city.